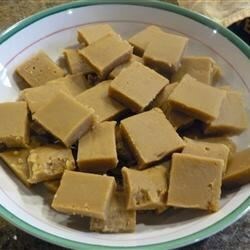 "Sucre la creme is a traditional fudge from the Quebec province of Canada. The ingredients are simple and few, but the result is sweet and delightful! And because this recipe is cooked in the microwave, you're never too far from a quick sugar fix!" In a large microwave-safe bowl, stir together the white sugar, brown sugar and cream. Cook at full power for 10 minutes, stirring twice. Let stand for 5 minutes. Use an electric mixer on low speed to beat the mixture for 4 minutes. Pour into a buttered 8 inch square glass baking dish. Refrigerate for 1 hour or until firm. Cut into squares when set. Super! As a French Canadian from Quebec I've been looking for this recipe. Tasted just like I remembered it. I think I've made 8 batches over the summer. Thank you for a little taste from home! I have been looking for this recipe for over ten years. A friend's mother made it when I was younger and wouldn't give up the recipe, wonderful, uber sweet and oh so dangerously addictive.